Hello friends! I’m impressed so many of you workout at home! Some great exercise DVD suggestions in the comments section of the last post, ch-ch-check it out. Today I left the comfort of my own home to work out. I wanted to run! It was –18 C without the windchill this morning (-1 F) so there was no way in hell that was happening outside. Baddabing. Stellar sweat sesh in 60 minutes flat. One thing I love about this workout is that I gets my heart rate up really high and keeps it there for at least the last 15 minutes. I can get my heart rate to peak at 175 bpm doing HIIT, but I feel like I’m training the ticker when I get it up in the 170s and “comfortably” keep it there for an extended period. Usually I come home after the gym to shower and eat before scooting off to work. But today I tried something different and went straight to work (showering at the gym). 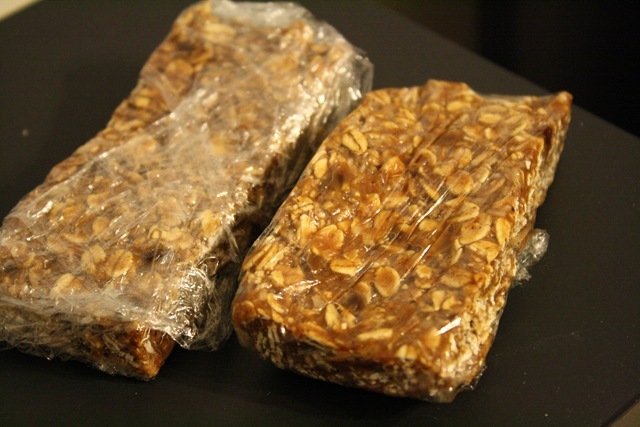 I packed two homemade protein bars for breakfast. Normally I would pack a breakfast cookie, but that’s what these things essentially are. I loved this new routine! I got a solid 45 minutes extra sleep, and felt much less rushed. It was also nice to get to work a little early and leisurely eat breakfast before the madness of the workday begun. McIntosh apple and two cheese strings. I don’t normally buy McIntosh, but they were on sale for $1/lb!! Sold! Yves veggie salami slices, marble cheese, mayo on bakery whole wheat bread (no more light bread- blech!) and a naval orange. Looks boring but it was mega tasty. What can I say, I’m a simple sandwich girl. 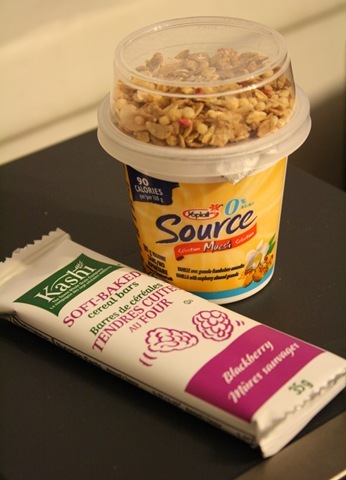 Source vanilla yogurt muesli cup and a Kashi blackberry cereal bar. I don’t normally buy flavoured yogurts, but these cups are pretty handy and tasty to boot. I have a ton of romaine and spinach at the moment, so I went for another salad for dinner. It was delicious. 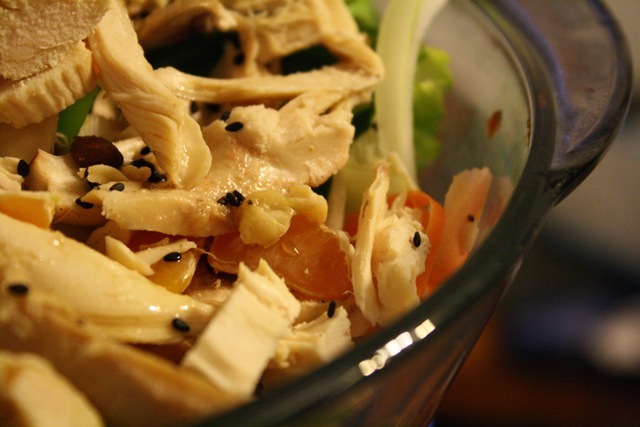 For the dressing, I shook up 1 tbsp apple cider vinegar, 2 tsp sesame oil, 2 tsp Bragg’s, 1/2 tsp agave. I LOVED this salad. 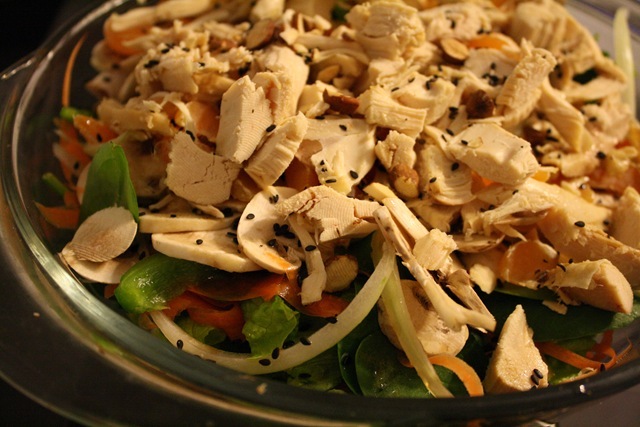 I tend to always make the same sort of salads at home. I need to branch out a little more. Salads can be fun! So. The title of the post. I have had a few days to mull over things, and in order to continue moving forward, I feel like it’s time to let the cat out of the bag. You may recall that Saturday was an “off” day for me. I alluded to something major happening in my personal life. Well, Chris and I broke up. Oof. That feels tough to say. I’m obviously not going to go into the dirty details. Chris and I spent four wonderful years together. We “worked” together seamlessly for almost that entire period of time. But due to several non-scandalous reasons, it seems we’ll be better off apart than together. Despite losing a dear friend, I am remaining positive about it. I have essentially spent no time as a single adult and I think it’s very important for me to do so. Especially in this period of my life. I remain excited about my current situation and opportunities for the future. I love my new job, am making new friends, pursuing my passions and reconnecting with my family. I am slowly starting to feel “full” again. This is a big deal, as just a few short months ago, I was feeling very “empty” indeed. Well that’s that. Time for me to go do the work I brought home. I’m thinking of trying out Jillian Michael’s No More Trouble Zones dvd in the morning, so I’ll review it for ya tomorrow. Also, I want to talk about the whole Heidi Montag plastic surgery thing. I’ve got a rant brewing! See ya tomorrow! We’re over the hump!